Where did 2012 go ?? What an exciting couple of weeks. I personally have really enjoyed the Olympics albeit from the vantage point of my own living room on catch up TV. Due to the demands of the Baby Loft and the additional tourists visiting London we didn’t get to attend any actual Olympic events but our equipment certainly did helping us to get into the spirit and partake in the Olympic mania that has swept the country. As you can imagine during the Games a vast amount of our deliveries have been into central London which if I am honest I was dreading and had convinced myself would need be a nightmare and worthy of a gold medal if we managed to get through them all without being snapped in a games lane and receiving a hefty fine, but alas my fears were unfounded as driving in the city the last 3 weeks has been bliss, rush hour ? where for art thou rush hour” ? We have easily transported buggies, cots, car seats,highchairs and play equipment in record times achieving our own personal bests (clever). The roads have been super quiet, the Olympic lanes clearly marked and London has looked fabulous. I cannot remember seeing it so clean & organised before and no roadworks. Yippee…. If only it could stay this way. My family have also had their share of Olympic involvement. 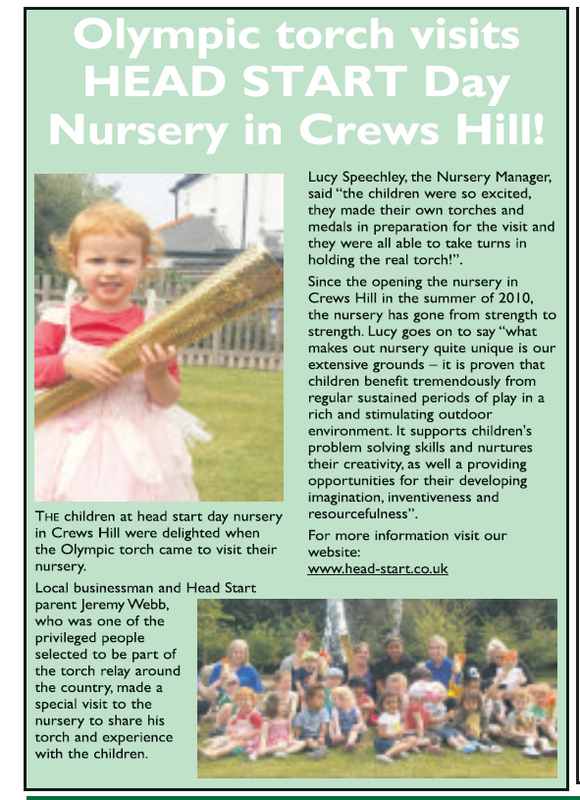 My little girl Olivia made it into the local papers when she got to hold an actual torch when it came to visit her Nursery, and my dad has spent the last 2 years working on the Olympic village & park. My sister had a gold medal in her hands yesterday when she got to meet the fabulous Laura Trott. All in all a great time had by all, a busy time for the business and a great showcase for our country. Now bring on the Paralympics… whoop whoop !! So after starting The Baby Loft two years ago I finally decided that it was high time for a well deserved family holiday. After spending the last two years back & forth meeting families at the airport and not actually leaving the country myself it was definitely our time. So I booked a week away for us in Italy in the Tuscan hills. Not one to make life easy for myself I decided it would be good to also use the experience to again validate the Baby Equipment hire concept, so I decided to take my own buggy & car seat for Olivia. Ohhhh Myyyyyyy never again !!! Travelling with little ones is a NIGHTMARE. Gone are the days when you stroll leisurely around duty free killing time. Before even leaving Stansted my husband & I were hauled off by customs officials to be searched and questioned as our buggy has tested positive to having a trace of explosives !!!! I KID YOU NOT…. Apparently this is quite common with buggies as they are wheeled over all types of terrain etc but the stress induced by this did not make for a pleasant start to our travels. Added to this the fact that you have to go to a separate baggage belt for the car seat & remember to leave the buggy at the foot of the aeroplane in the hope that a steward will remember to “toss it literally (glad it was a Maclaren & not one of my iCandy or Phil & Teds)“ it into the baggage hold. Then upon landing locate everything from various places around the unfamiliar airport then try to balance baby, suitcases, car seats, buggys on a wonky wheeled trolley whilst trying to find a nice english speaking person to direct you to your hire car so you can get away from all of the madness. And I only have the one child…….. I have a renewed admiration for the families that travel with numerous children and mothers that travel alone with their little ones I SALUTE YOU !! Never again will I travel with my own baby equipment I will hire, hire, hire. I am often told by my customers that my business is a fabulous idea and totally necessary, now I know it 100% for myself. By the way, the holiday was fabulous just can’t wait until next year, now who can I hire from ??? ?